During the dark days of the Great Depression and World War II, Americans huddled around their radios hoping for the latest news and a little inspiration. The fireside chats by Franklin Delano Roosevelt were staples of listening from 1933-45. The series of 30 talks dealt with economic recovery and war over 15 to 45 minutes. Roosevelt spoke in a simple style so everyone could understand him. Indeed, 80 percent of the most commonly 1,000 words were used in his speeches. TV eventually replaced the radio as the dominant medium, but every president since FDR has continued regular radio broadcasts. Indeed, it has been a weekly staple by recent presidents, including President Obama. 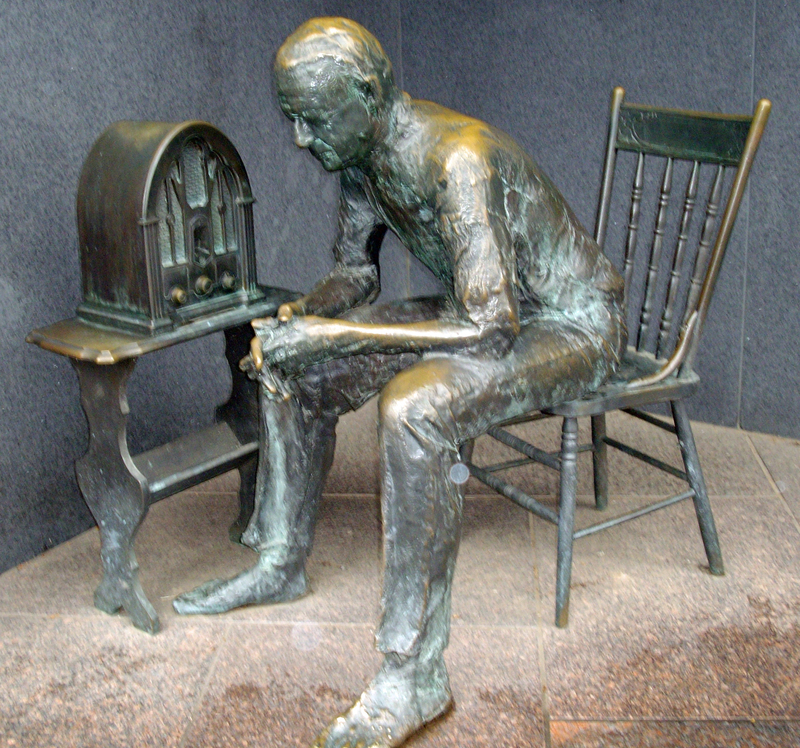 This sculpture of a farmer listening intently to the radio is in the FDR Memorial not far from the breadline. This entry was posted in Monuments and Statues and tagged Best Washington DC walking tours, FDR Memorial, listening to radio statue, Photo by Rick Snider, Washington D.C.. Bookmark the permalink.